Ensemble Bio: The Neo-Tessares Saxophone Quartet (John Perrine - soprano saxophone, Breegan Arnett - alto saxophone, Allison Denham - tenor saxophone and Tom Lempner - baritone saxophone) was formed in Cleveland, Ohio and has performed for 10 years in the area. 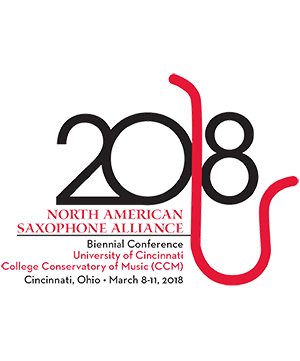 Two members are instructors of saxophone at Cleveland State University (John Perrine and Tom Lempner) and two are graduates of the program (Allison Denham received her MM in saxophone performance from Cleveland State and Bregan Arnett will receive her MM in saxophone performance in Spring 2018. The group is dedicated to bringing saxophone quartet to traditional and untraditional spaces playing traditional and not so traditional music to these spaces. The group was recently a featured ensemble at the Ohio Music Educator's Association conference performing a mix of standard repertiore and new works for saxophone quartet and electronics.